Can you really retire early? Yes, you can, but it takes a lot of hard work and discipline to first plan a strategy and then stick to it. There are a bunch of early retirement bloggers out there and although they share a lot of solid nuggets of information, it only takes one error to completely derail your plans. I will outline what it takes to retire early and a few common landmines to watch out for on your path to early retirement. What Is the Best Withdrawal Rate? What do you think the difference is between retiring early and financial independence? To me, I see retiring early as an action, possibly a scary action. Did you know that the fear of running out of money is greater than the fear of death? Financial independence is the point where you have options. You have the ability to be financially independent of working a traditional job if you choose. I have worked with clients at this phase in their life and they actually are thriving in their career and are in no rush to exit the workforce. Over the last year since I created Level Up Financial Planning, I have talked to potential clients who wanted to retire early and that have wanted to have financial confidence in their actions so that they can be financially independent in the future, not retire early. It is interesting to me because I have found that those that purely want to retire early were not a good fit to work with me. The conversations where they were excited about life and the possibilities that being financially independent can provide them, were like gold. It showed me that there is something more there to motivate them to make the hard choices. I guess my takeaway for you from that thought is, I think you will be more successful if you create more meaning around your goal to retire early. The rate that most individuals and families should save at for retirement if they start in their early twenties is 15%. Two problems with that. Most people have a hard time-saving at that rate even when you include employer matching contributions. That is the rate to retire around your early 60’s. The early sixties may still be an earlier retirement than most of your peers. Especially as retirement balances continue to be significantly underfunded by Americans. Social Security also has some issues when it comes to the liabilities of future payments. Social Security may either reduce benefits or push the age of normal retirement to an even greater age. Originally Social Security considered Full Retirement Age to be 65 but has been transitioning to age 67 based on year of birth. The more you are able to save above the 15% target, the more years you may be able to shave off from being required to work. How do you make the leap from what you are currently saving to unnatural levels? Basically, you cannot operate like the normal American. You will likely need to stick to your needs and sparingly pursue wants if there is a monetary impact. Another observation I have had similar to my last is the people more likely to be able to pull off the possibility of retiring early had no family. 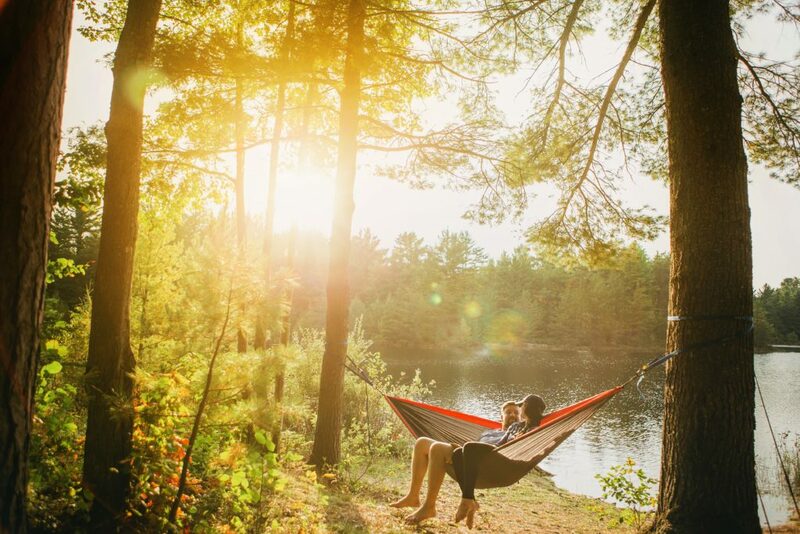 Not saying that is the criteria in order to retire early, but if you think living like a minimalist is hard for a single individual, then try explaining to your spouse and children why they cannot have the new shiny things. The things that they see neighbors and characters on TV have (if you have a TV). If you are new to living off the essentials only lifestyle, then this is going to be a massive adjustment. Luckily, studies show that you can create a new habit in 66 days. Just do not fall off the wagon once you have your new thrifty living habit rolling! I am actually a big fan of “good” debt and the leverage it creates for you to build wealth. Especially early in your working career. Avoid credit card debt and other consumer loan debt like it is the plague. What do you do with all of that savings? Should you put it all somewhere really safe? Even with a high savings rate, you likely need to achieve something greater than what a bank or credit union will pay you on your savings. That is because the average life expectancy for an individual male is 83.2 and a female is 86.9. Even people that retire at a traditional age of 65, still have about 20 years to make their retirement funds last. If you stuck with me this long, then you are building a strategy for early retirement or at least financial independence at an early age. Early retirement creates additional stress on your investments. Please do not take this as a recommendation, only as potential options when it comes to investing your savings. The most common methods for people to successfully retire early or retire at all is through the following investments. Not only does your savings/investments have to cover your expenses as you know them today, but there are also a few other things to watch out for on your path to early retirement. Multi-layer marketing schemes: Recruiting and sales-based income. Real estate flips: Purchasing a property that requires TLC and fixing it for sale, hopefully at a profit. Property tax liens: Potentially high returns, but with substantial risk. Online business: If you build it, they will come. Not necessarily. Speaking from experience, building a business is a long grind. Hot stock tips- The only people with true hot stock tips are insiders to a company and that is 100% illegal. Remember all of those years that you would be living in retirement if you were to retire early. Your expenses have a powerful force working against them called inflation. Inflation is the gradual increase in the costs of goods and services. The average inflation rate from 1988-2018 is about 3.79%. To make matters worse, this inflation rate has a compounded effect. Inflation is the main reason you need investments potential growth rate to be better than what you would get in a savings account. So, a trip to the grocery store could cost $100 today, but in 30 years the same shopping cart would cost $305! One of your costs that jumps substantially if you retire before the Medicare age of 65 is health insurance. Not only does the premium cost increase, but that is likely for a high deductible health plan with a large max out of pocket limit. If you are north of 30, you may have already begun to feel some of the impacts of aging on your body. Personally, I started noticing around 27. This only continues into retirement and through the later stages of your life. Plan to have a larger degree of your expenses be out of pocket medical expenses throughout retirement. Have you ever heard of long-term care? It is actually different than your common medical expenses and is not covered by health insurance. Long-term care applies to individuals who become unable to live independently because you are unable to perform one of the following activities of daily living. It is projected that individuals 65 and older will have a long-term care need have a probability of 52.3%. This type of care is ridiculously costly and can blow up any plan. Although the type of care cost varies, a full-blown nursing home median to be about $82,125 per year(2018 National Average, Semi-Private Room). There are long-term care insurance options available, but over the last ten years, the cost has skyrocketed. Another overlooked part of many early retirement plans is the fact that the stock market does not work like clockwork. Although the average returns may continue to play out into the future, short-term market losses or under-performance may require you to draw down your retirement assets faster than expected. 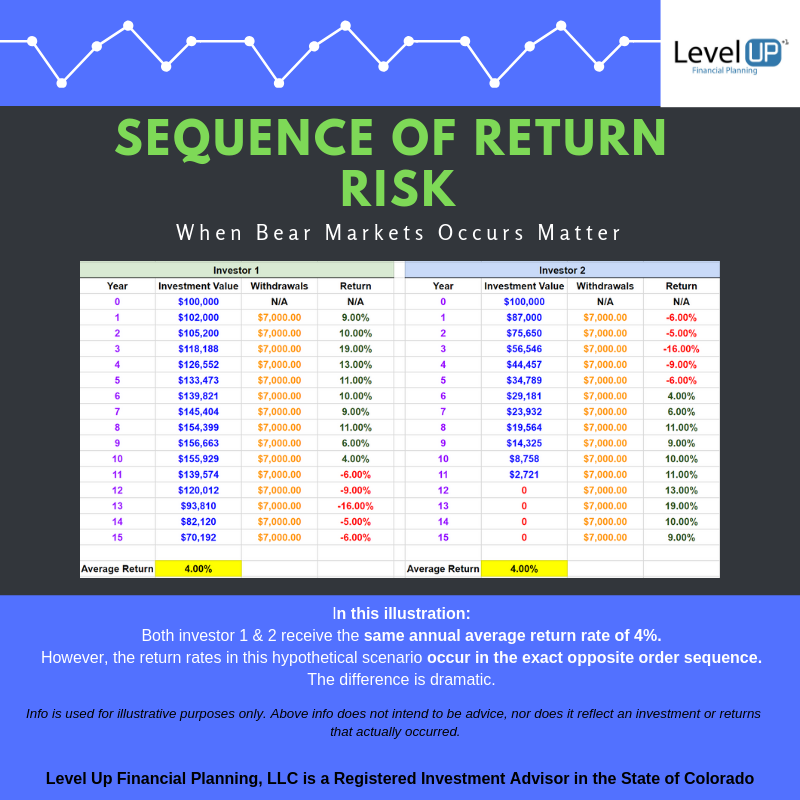 This risk plays out through the phenomenon called the “sequence of returns”. The sequence of returns addresses the impact withdrawals from your account has during different market cycles. See the image below illustrating two scenarios: both average the same annualized return, however when the returns occur greatly impacts your assets ability to maintain its’ value. These investors averaged the same annual return rate over 15-years in this hypothetical scenario. However, the timing of their returns occurred in the exact opposite timing. One with a recession at the end of the 15-years and the other with it occurring at the start of 15-years. The impact is dramatic. A big indicator of whether your funds are likely to last throughout your retirement is the percentage you withdraw from your assets annually, which is known as your withdrawal rate. There are a few methods you can use to estimate your withdrawal rate. The hypothetical scenario in the sequence of return illustration above was an example of a one-time calculation of the withdrawal percentage. It was 7% or $7,000 a year. As long as your assets can maintain a withdrawal like this, doing the first calculation and then automating your withdrawals is a simple way to receive a consistent paycheck from yourself. Using this method you will need to calculate your new withdrawal amount every year. Using the same illustration above as a starting point we will use the initial 7% withdrawal rate, which equals $7,000 annual withdrawal. However, in the following year, we need to recalculate since the balance has changed. Investor 1’s new withdrawal amount would be $7,140, but Investor 2’s new withdrawal amount would be $6,090. This method produces a lot more variable income but actually helps a little in protecting your retirement assets in down years by reducing your withdrawals. There has been a lot of research that indicates a 4% withdrawal rate being a safe amount to withdraw and not deplete your assets for a 30- year retirement (assuming that you do not make major mistakes in allocation). What happens though if you succeed in reaching financial independence and actually retire early? The longer your expected retirement the small your safe withdrawal rate would be. The amount of risk and performance of your investments will also have a major impact on your individual/family safe withdrawal rate. Retiring early is a lofty goal. One that is possible, although as you may have noticed, it is not without challenges. I hope this strategy guide opened up your eyes to a few of the blind spots that many others have when it comes to retiring early so that you can prepare and be more confident when you do reach that point. If you have trouble making changes to increase your chances of being able to retire early, you may want to do a little more visualization of what retirement will look like for you. I love helping my clients think big and break down barriers when it comes to achieving their goals. If you do not have the time or want a second opinion on your current plan, I would be happy to be a resource for you.